The priests and spiritualists prepared Pṛthu’s coronation by gathering everything necessary from people in the surrounding countries. Everyone offered riches for the ceremony, even the deer, birds, cows, and divine serpents, even the earth, sky, seas, rivers, and mountains. At the ceremony making him emperor, Pṛthu was exquisitely dressed and wore the finest ornaments. His wife Arci, “the splendid,” indeed appeared like a new form of fire in her brilliant jewelry. The gods themselves presented gifts to bless the emperor. The god of wealth, Kuvera, gave him a great throne made of gold. The god of waters, Varuṇa, gave him an umbrella that shone like the moon and emitted cooling mist. The god of wind, Vāyu, gave him fans. 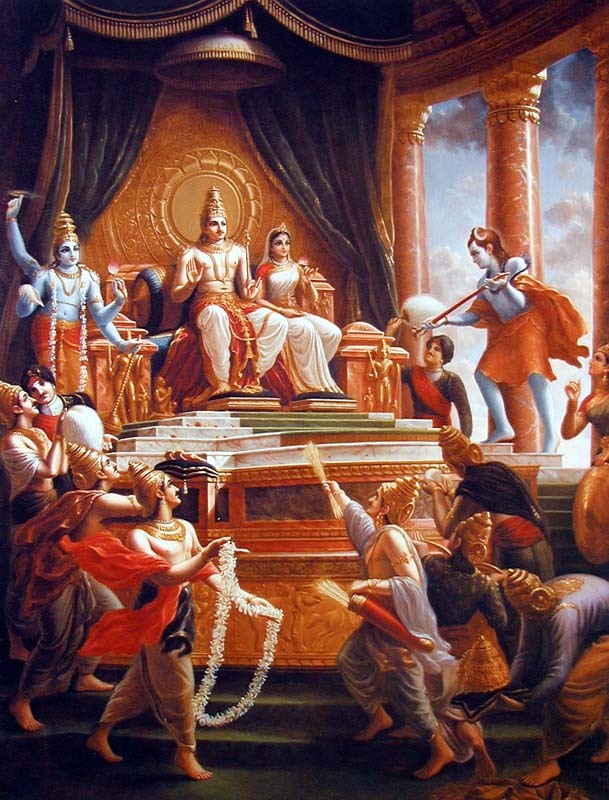 The god of morality, Dharma, gave him a necklace of fame. Indra, the king of paradise, gave him an exquisite crown. Yama, the god of punishment, gave him a the enforcer’s scepter. Brahmā, the original speaker, gave him armor made of words. Bhāratī, goddess of learning, decorated him with perfect pearls. Hari gave him the beautiful Sudarśana discus, and his wife, the goddess of Fortune, gave him inexhaustible opulence. Rudra, god of destruction, gave him a ten-moon’d blade, and his wife Ambikā gave a hundred-moon’d sheath. Soma, god of immortal nectar, gave him ageless horses and Tvaṣṭā, the divine architect, gave him a chariot that embodied beauty. Agni, god of fire, give him a bow made from the horns of cows and goats, and Sūrya, god of the sun, gave him arrows made of light. Bhū, goddess of the earth, gave him magical shoes. The heavens themselves constantly offered flowers. The Khe-carā, gods in the sky, would teach him the arts of dance, singing, musicianship, and the art of invisibility. The sages blessed him to be truthful. The ocean offered a conch born from her womb. The seas, mountains and rivers created royal roads.